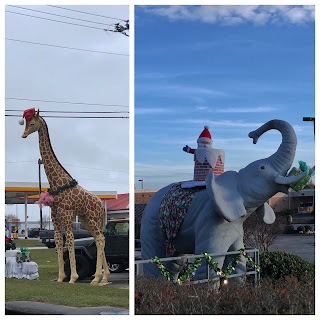 On December 18, 2018 we said good-bye to our friends Peggy and Paul and headed west to Pass Christian, MS.
A short uneventful drive just like we always wish for. Pass Christian RV Park was home for a month. This is the second time staying here. The first time was in January 2018 on our way to New Orleans. This is a small no frills park with mostly permanent residents. 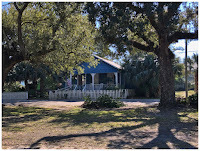 It is well maintained and there are bathrooms and a laundry room. We were in Site 2, a level gravel pull through with grass and a picnic table. Sites are about average width. There is no WiFi but our Verizon signal was strong. We paid $16.00 a night with their monthly rate and Passport America discount. Lots of dogs in the park and Mielikki loved making friends with them. 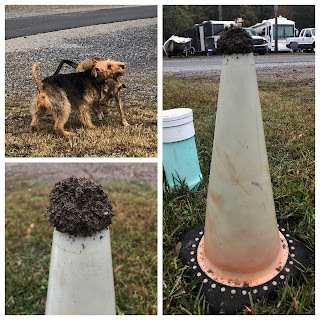 One morning when we came outside we discovered that through the night the ants had been busy and built an ant hill inside this cone! Shortly after this picture was taken we got rid of them as they were red ants - and boy do they hurt when they bite. There are lots of places for dog walking as there is very little around here. Nancy and Mielikki got their 2 mile walks in most every day. There are a number of dead end roads that have no houses on them - some where nothing was ever built and others where houses were destroyed during Hurricane Katrina. Of course water and birds everywhere and we loved the faded and vine covered stop sign. One day Nancy's hip was bothering her and she didn't bring her cane so she found a large stick to use but Mielikki thought for sure it was for her! Yes, Nancy finally gave up and let her have it. One of the best parts of staying in one place for a month is that it gives us time to work on projects. We have been on the lookout for a new table for months and being cheap we didn't want to spend a fortune on a new one. 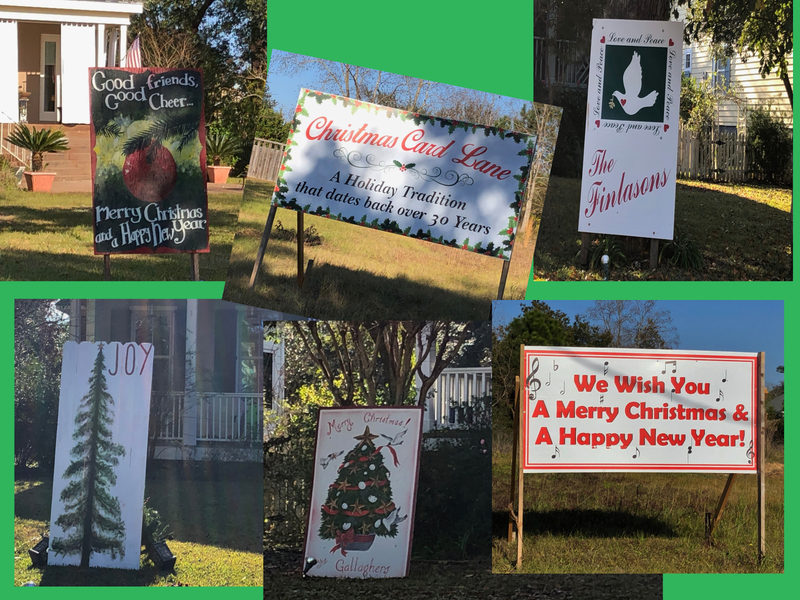 So every Good Will, Salvation Army, Habitat and Antique store we passed we would stop and look. Well, we finally found one at a Salvation Army in Gulf Port. It is the exact size we wanted and it was only $60. 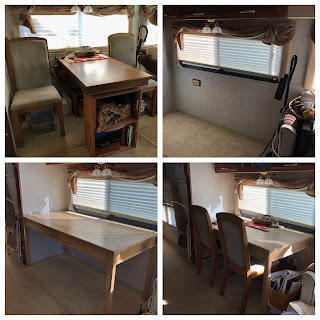 Taking out the old table was much easier then we thought. We now have so much more room for cooking, crafting and anything else. In fact Nancy put it to good use right away and covered our boring dining chairs. She had a tablecloth from her friend Sarah who passed away a few years ago and it is the perfect weight and color for chair covers. 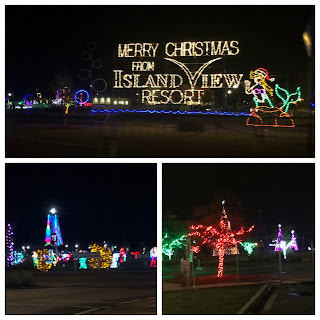 We celebrated Christmas here with our tradition of going to the movies. 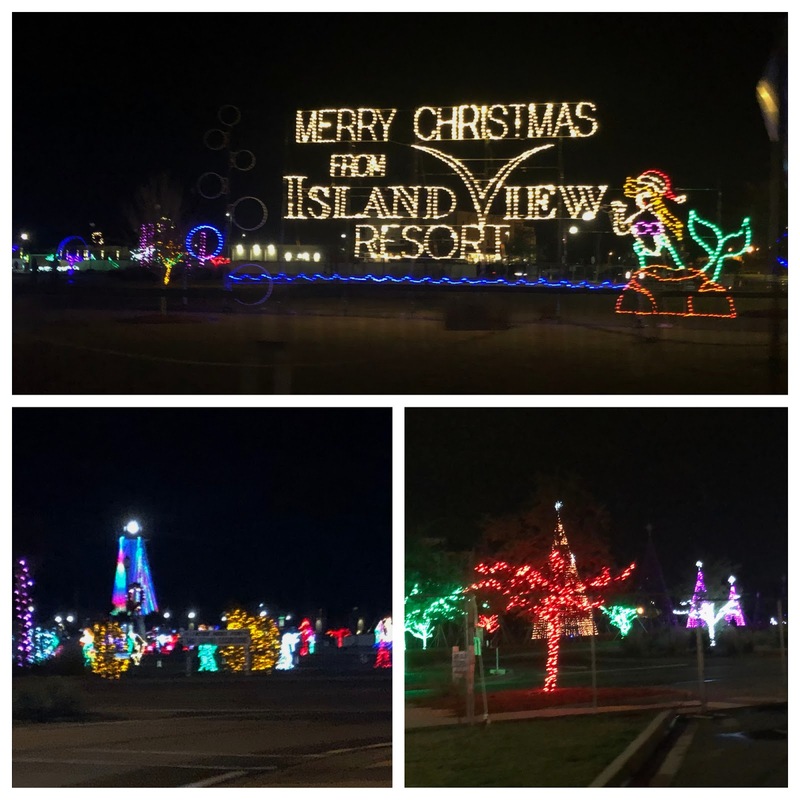 While the houses in the area didn't have a ton of light displays there was a Light Show put on by the Island View Casino. 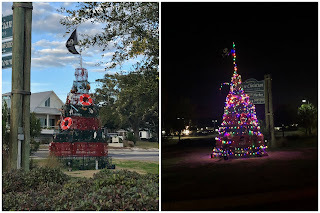 There were some fun holiday items. 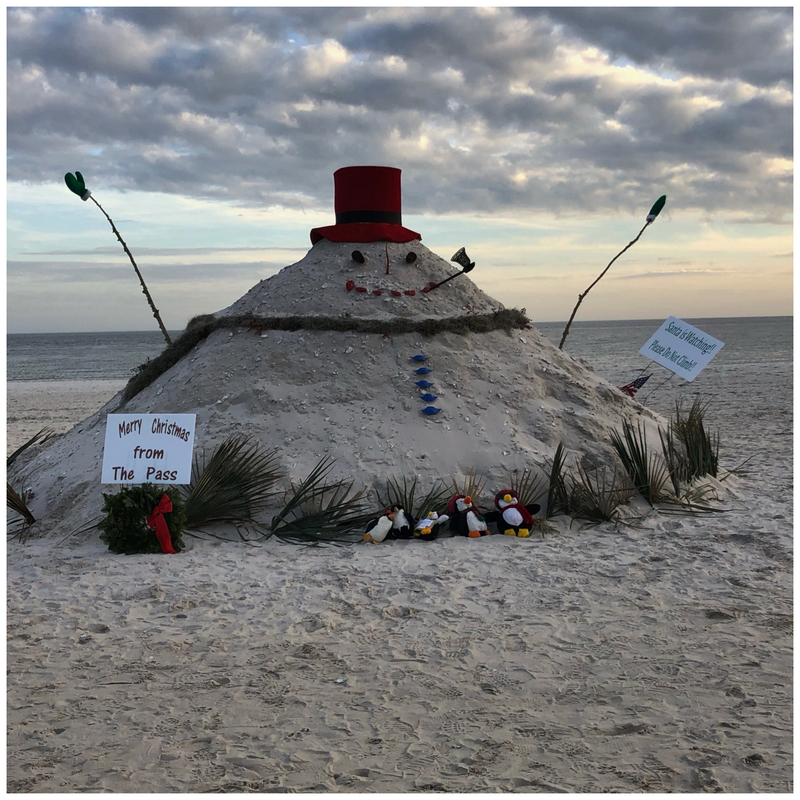 A giant Sandman on the beach and a Crab Cage Tree in Pass Christian. A whole neighborhood street in Bay St Louis had wooden Christmas Cards on their lawns. What a fun idea. We had a mix of weather while here lots of sunshine but also plenty of rain and foggy days. 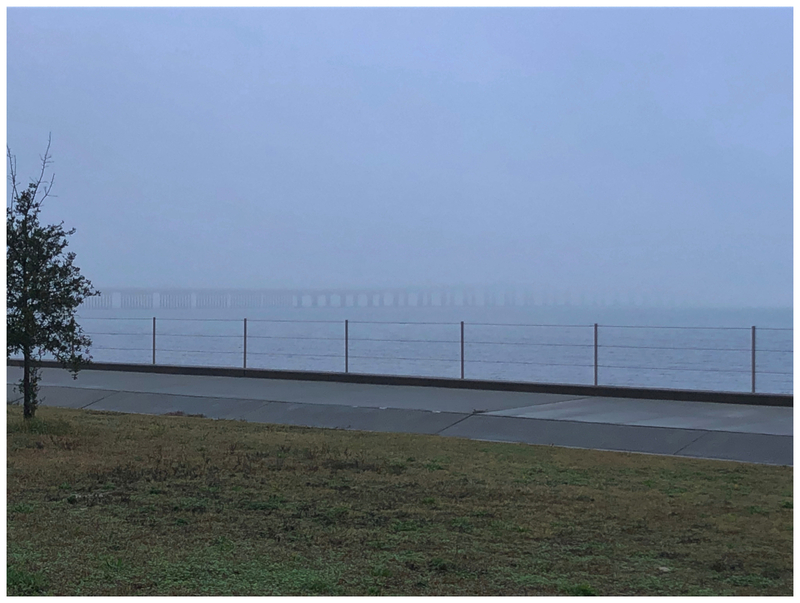 The rain we could do without but we do love the fog. 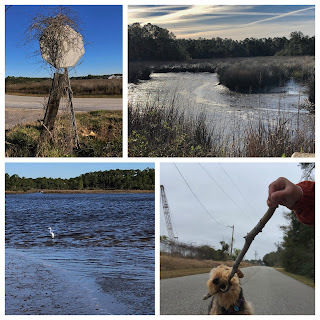 We walked to the end of the Libby Milner Roland Pier in Gulf Port. 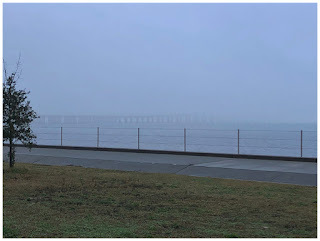 One of the foggy days made it very hard to see the bridge that connects Pass Christian and Bay St Louis. 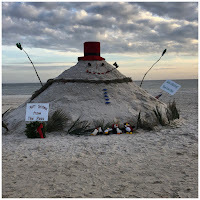 We also enjoyed a number of sunny days on the beach as well. Mielikki loves the beach. 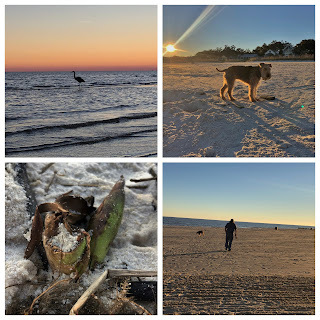 She searches for seaweed and driftwood as much as Nancy does. Our new friend gave us quite a show one night. Even though the day of the kite show in Long Beach was a little rainy there were still a lot of kites in the air. It is so much fun watching them float about. The Visitor Center in Bay St Louis is in the historic L & N Train Depot. 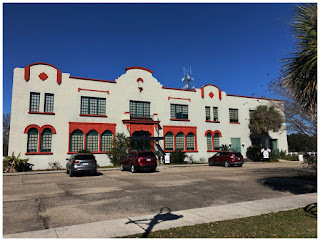 A beautiful Mission style building. One half is a small history museum. The Mississippi Blues trail goes through Bay St Louis and they have a wall dedicated to blues musicians. 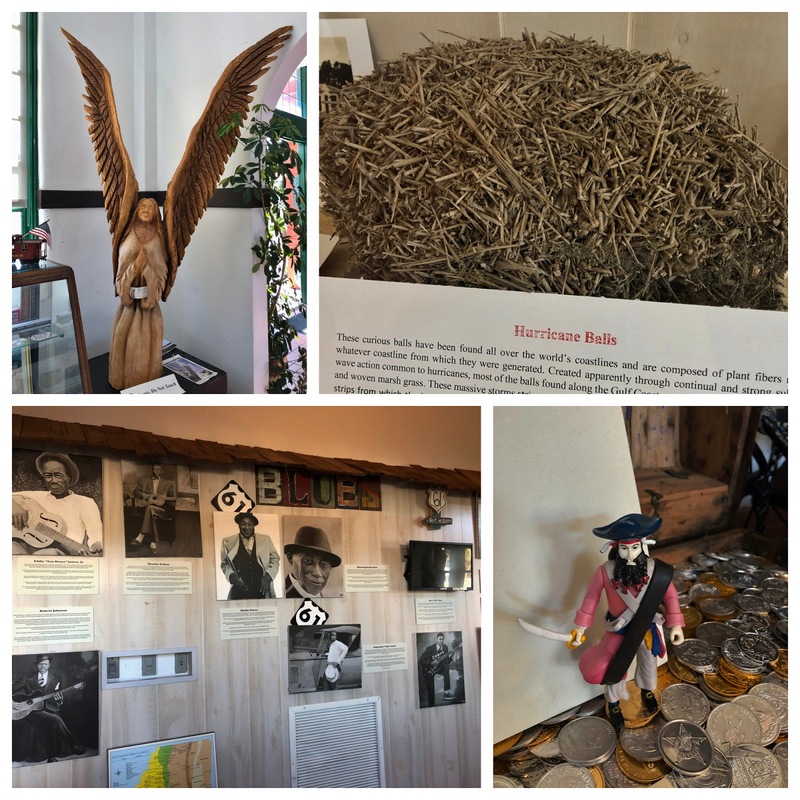 There are cases with local artifacts and Hurricane information. The shores of both Bay St Louis and Pass Christian are lined with carvings like this angel. Carved from trees destroyed in the hurricane. The link at the beginning of the blog has lots of pictures of them. 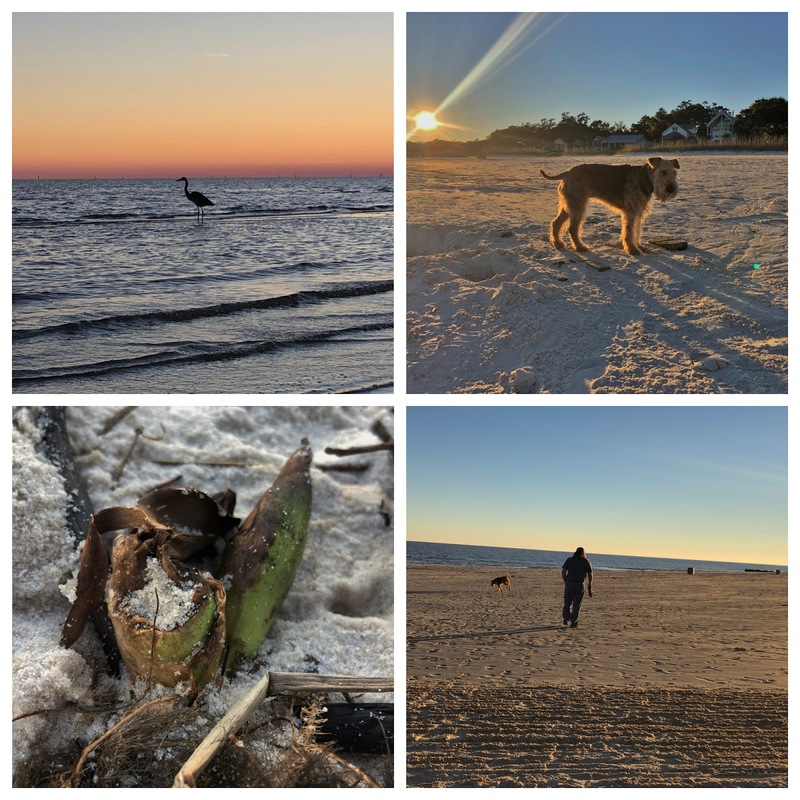 The upper right picture is of a Hurricane Ball, these unusual balls have been found all over the world's coastlines and are composed of plant fibers native to whatever coastline from which they were generated. They are apparently created through continual and strong wave action common in hurricanes. 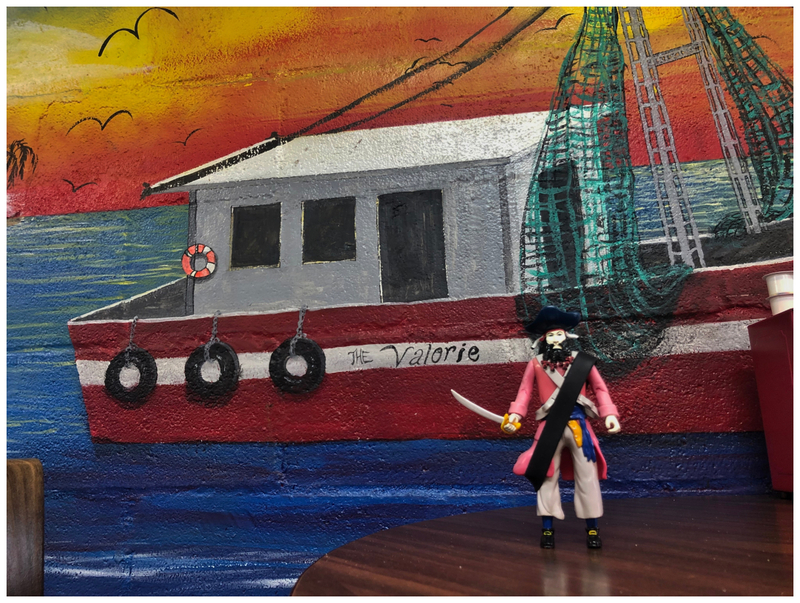 This area was a popular place for Pirates back in the day, our Captain tried to sneak away with some gold. The other section is dedicated to a Mardi Gras Museum, local participants of previous parades have loaned their beautiful costumes to the museum. 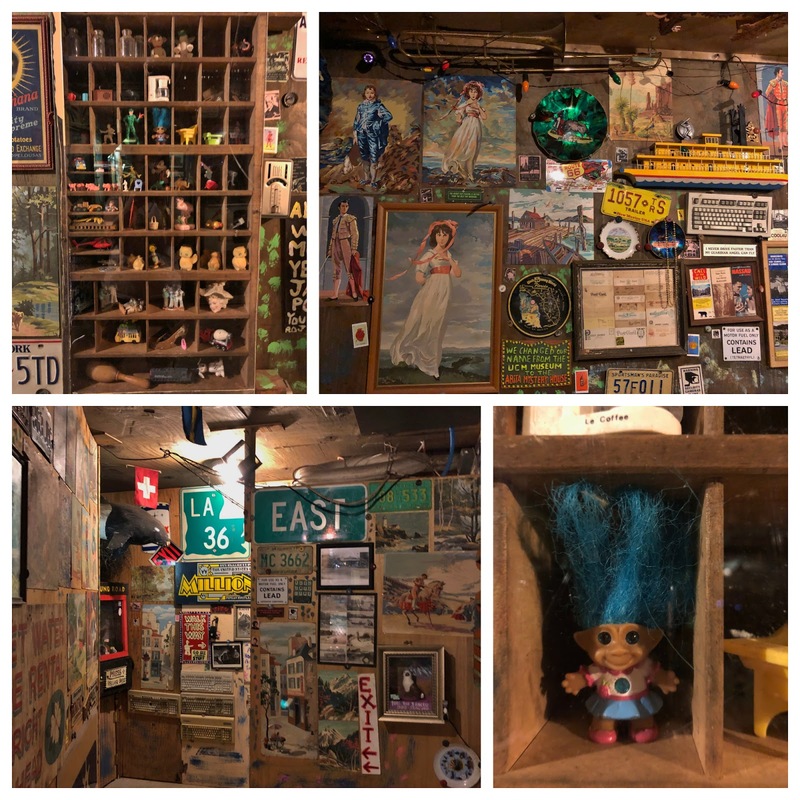 The second floor is where you will find the Alice Moseley Folk Art & Antique Museum. Miss Alice as she was called started painting at 65 to help relieve some of the stress of caring for her mom who had Alzheimer's. 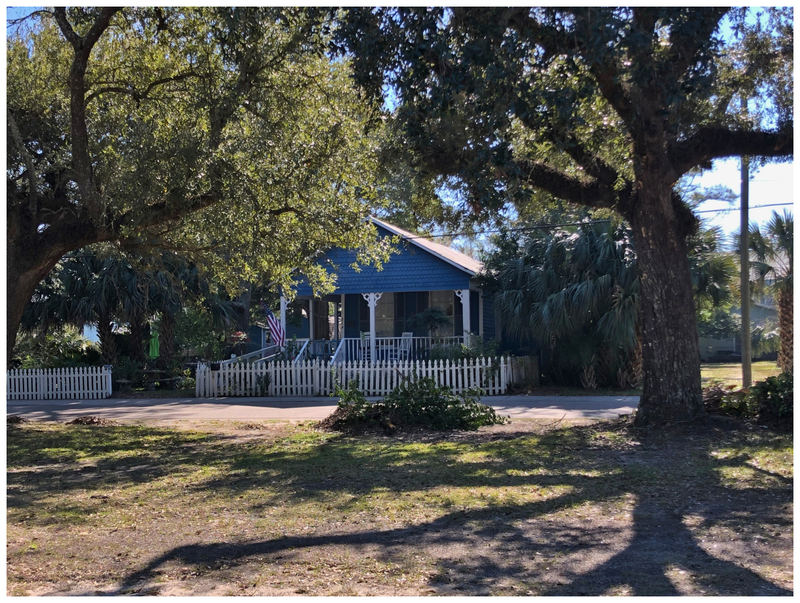 She was 79 when she moved to Bay St Louis, she came here for an art show and fell in love with the town. The link will take you to the website for the museum and her history along with pictures of her paintings. You are not allowed to take pictures in the museum, but we did get a picture of the house she lived in which is right across the street from the museum. We bought this print with a rainbow over Bay St Louis for our niece Lillian who loves this town. Just down the road from our campground was our favorite place to have breakfast. Daddyz in The Pass. Good food and great service, Heidi was our waitress just about every time and we miss her smiling face. She always gave "Santa", as she called Les and Captain a hard time! 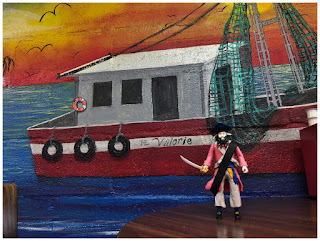 There mural was the perfect place for a Captain selfie. 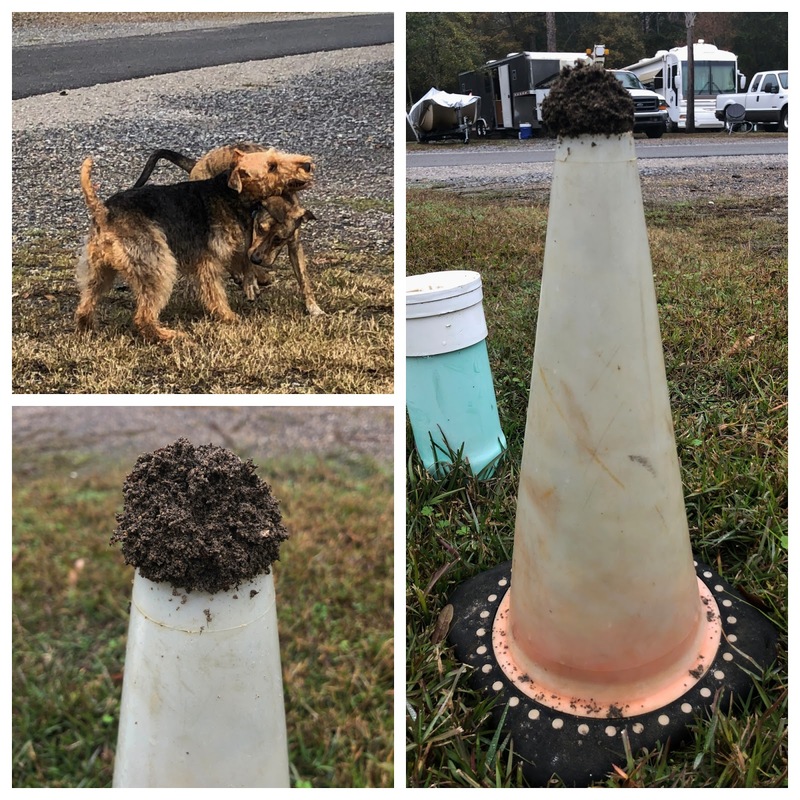 We found all the Roadside Oddities the last time we were here. On that visit the Giraffe and Elephant in Gulf Port were dressed for Mardi Gras. 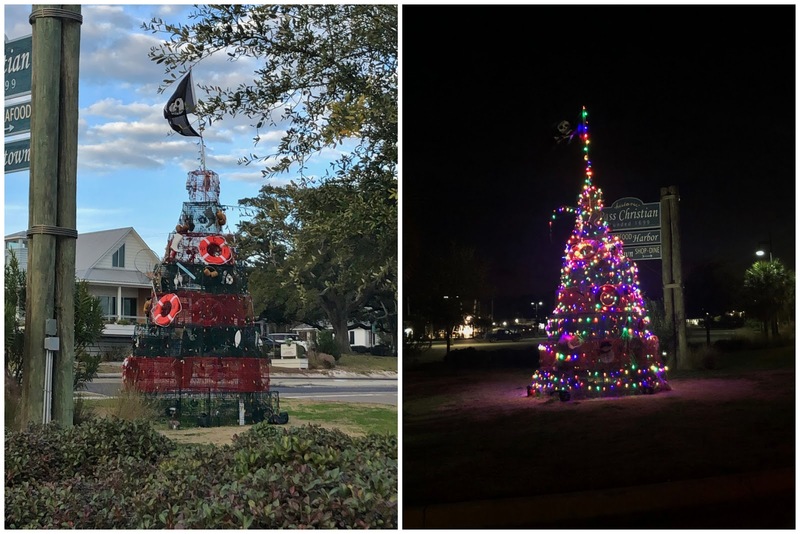 This time they are decked out for the holidays. 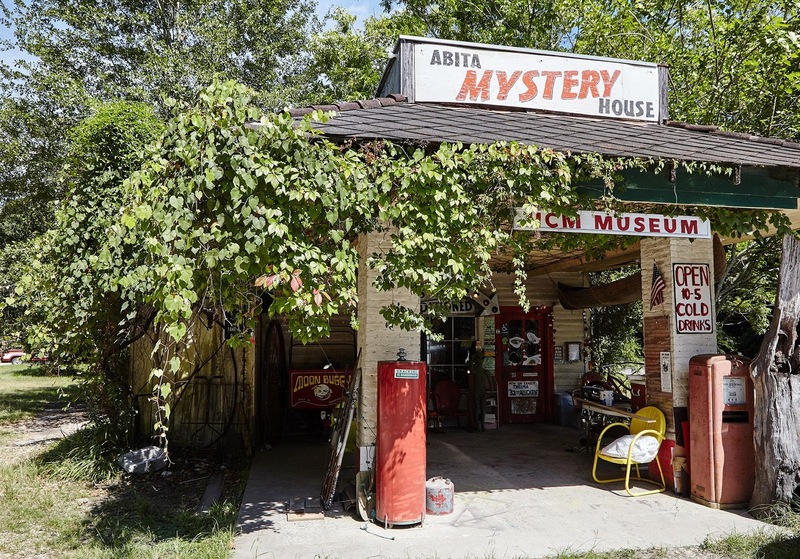 We learned about the Abita Mystery House from Roadside America. 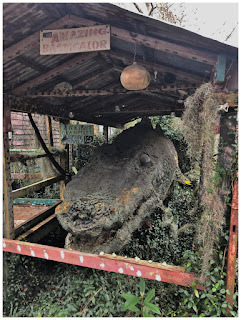 It is in Abita Springs, LA. 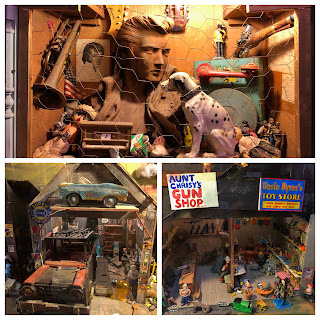 John Preble was inspired by the Tinkertown Museum in New Mexico. We visited there in October 2016. The museum is in an old Standard Gas Station, or at least the unique gift shop filled with all kinds of fun trinkets is. The museum itself is contained in numerous buildings behind the gift shop. They are each filled to the brim with everything you can imagine. 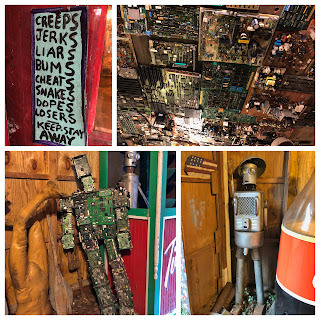 The sign at the front door lets you know the type of people they don't want, the ceiling of the gift shop is covered in circuit boards. Nancy was wondering if any of them came from Circuits DMA, where she worked back in the 1980's. Tin men and Robots could be found everywhere. There are showcases filled with tiny vignettes of towns, circuses and more. Some are animated and all will make you chuckle. 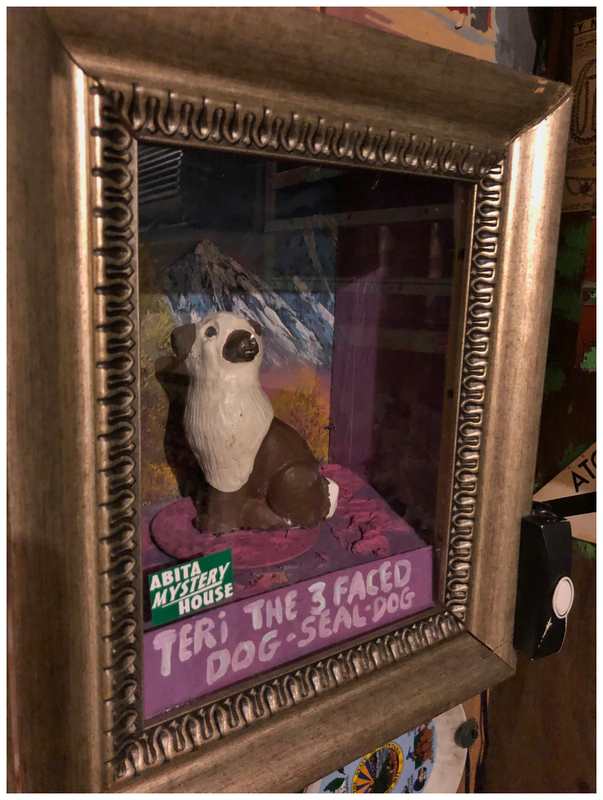 Teri the three faced dog-seal-dog is one of them. 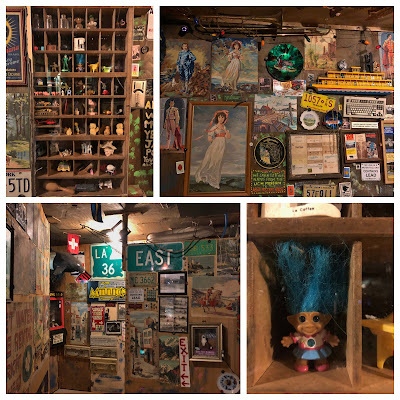 Every inch of the walls are covered with pictures, hand painted signs, license plates and even bottle caps, old phones and tools. Nancy's mom had pictures very similar to the ones in the upper right picture. 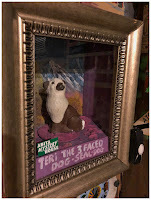 There were also a number of shadow boxes filled with all kinds of crazy things. The grounds outside were as wonderful as inside. Aliens landed in one section. There is a whole shack dedicated to Hot Sauce. 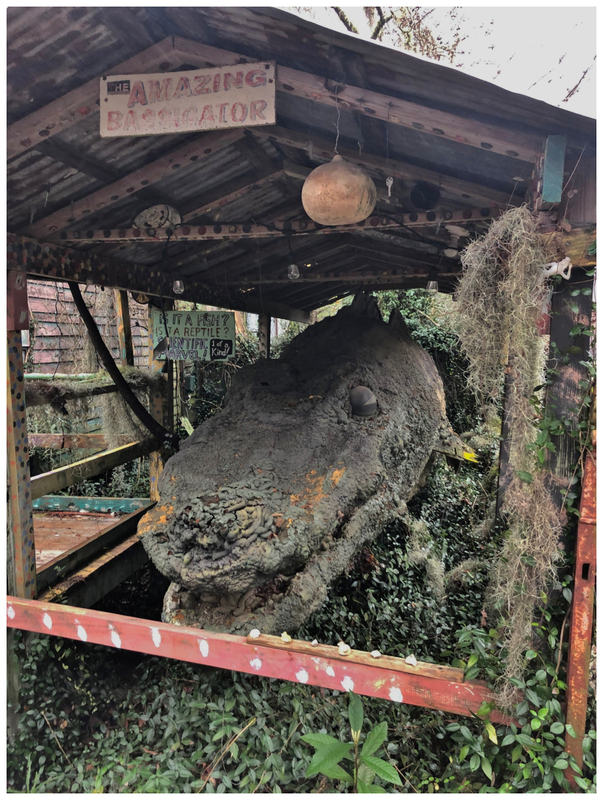 Alligators and other creatures could be found lurking around every corner. Buford is the creation of Dave Kelsey and John Preble. Using the measurements of a real alligator head and a bass fish they created this friendly guy. 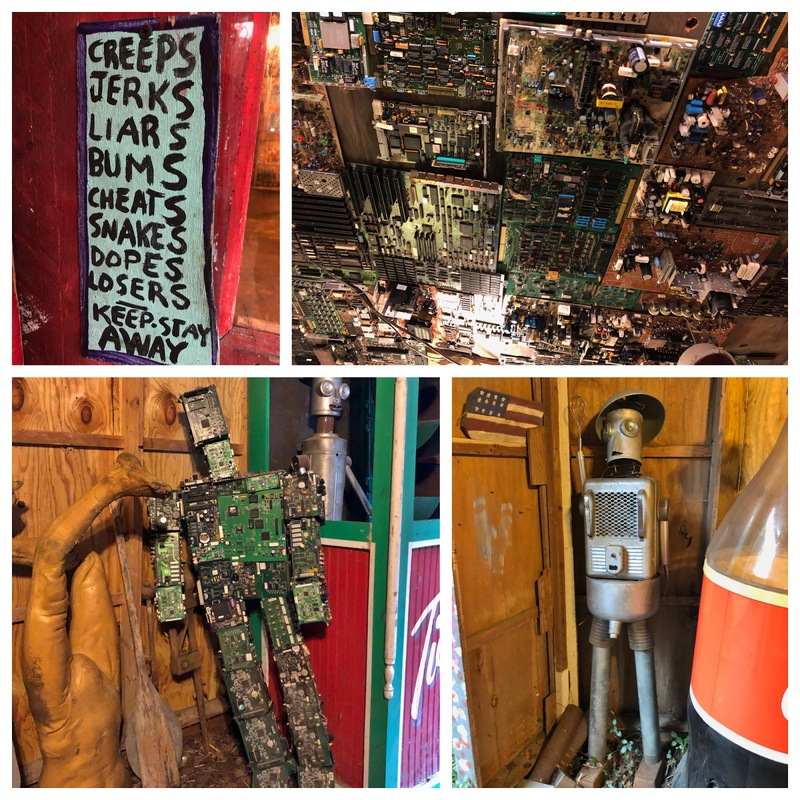 He is made of plywood, chicken wire, fabric and beach balls for his eyes. Then covered in fiberglass to create the textured skin. 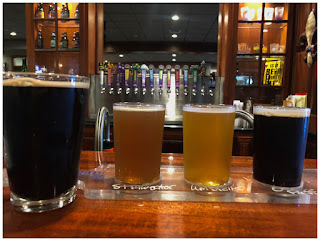 After all of that excitement we needed to wet our whistle and what better place than the Abita Brewery. We enjoyed a flight and great conversation with the bartender. 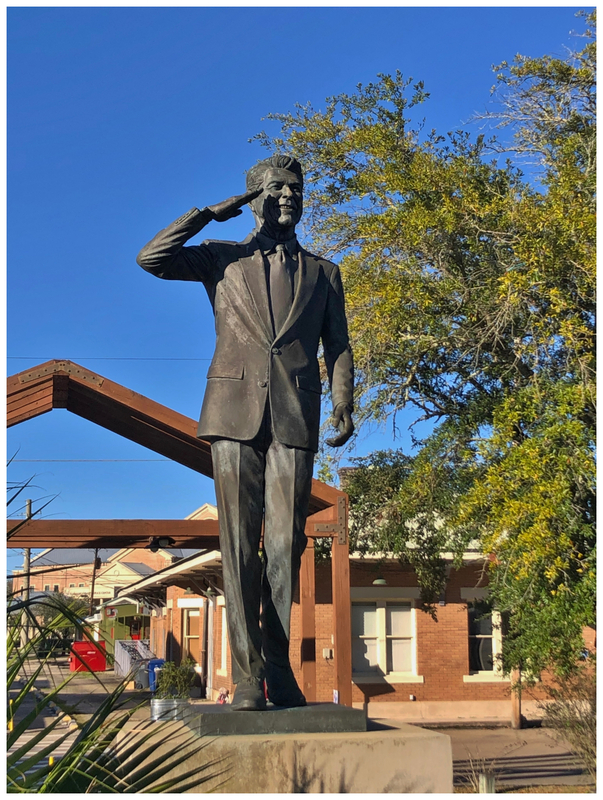 What is claimed to be the worlds largest Ronald Reagan statue stands in a park in Covington, LA. That statue is 10-feet tall and sits atop a 6-foot pedestal. Covington had been a Democratic stronghold for a century. Then hard times fell on the town during the oil bust while Reagan was in office. 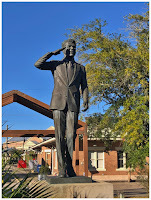 Seems strange but the town turned Republican and in 2008 the statue was erected. We will leave you one of the beautiful sunsets we enjoyed during our stay. 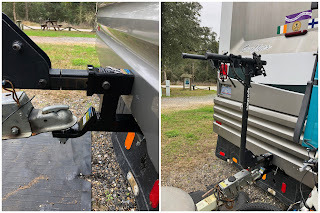 It is amazing the things there are to make RVing life easier. 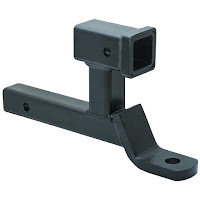 We purchased a Mulli-Use Ball Mount and Hitch Receiver at Harbor Freight. We also had to go back and purchase a new ball as the one on our existing hitch did not fit. So check the size of everything before you head to the store. 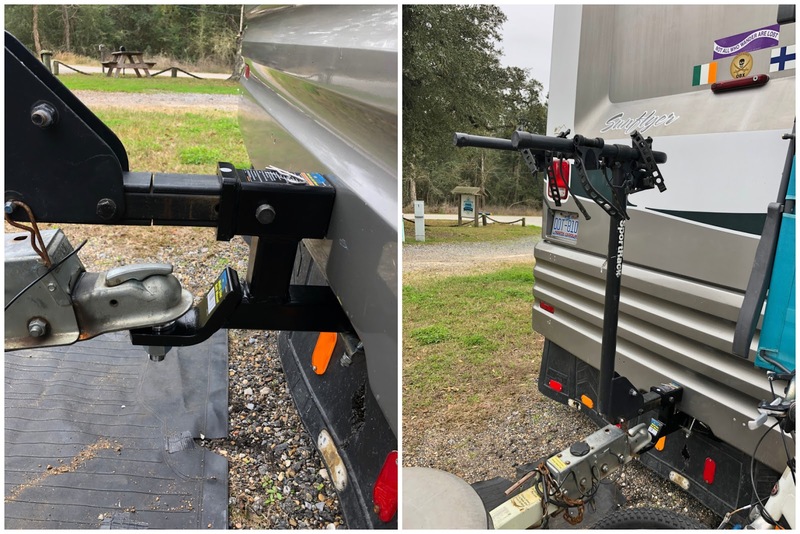 This now allows us to attach our bike rack to the top portion and our tow-dolly to the ball. We also have bike covers that we use that are not shown in the picture. We had actually stopped taking our bikes with us because prior to this we had to put the bike rack on the back of the car when moving from one place to the next and then take it off once settled in so we could get into the back of the car while out and about. Then we had to repeat this for every stop. This is so much easier. Note: On one of stops we realized that you cannot attach the tow-dolly to the ball while the bike rack is attached. So make sure anything you are towing is attached before you put the bike rack and bikes on!